Last week, I read two books- Never Mind Yaar by K.Mathur and Half of a Yellow Sun by Chimamanda Adichie. The two books couldn't be more different from each other, one frothy and fun ,while the other hard-hitting and intense. Half of a Yellow sun is Chimamanda's second novel about the Nigerian-Biafran war that took place between 1967-70.A little history before I get into the book.. The war broke out because the South-Eastern part of Nigeria tried to break off and form an independent entity, The Republic of Biafra. The genesis of all is this said to be the creation of Nigeria, composing of many ethnic tribes (Yoruba,Hausa, Igbo,Fulani) that were inherently very different. from each other.For instance, Hausa tribes are predominantly Muslim,whereas the Igbo are Christians. The hostility between the tribes peaked when the Igbos staged a coup and proclaimed their independence. They could not succeed as very soon Nigeria shot back and a bloody war followed. For three long years, many Igbos were raped, killed and displaced from their homes ;boys lost their childhoods and were forced to fight the war without proper training. In 1970, the war ended with the Biafran leader accepting defeat and the Igbos becoming once again part of the Nigeria. ( Info from Wikipedia and from the author's note at the end of the book). The book is a beautifully crafted and Chimamanda has chosen to tell the story of the Biafran war through three charecters- Richard,an Englishman who prefers to be called a Biafran rather than English; Olanna, the beautiful and sensual Igbo who lives with her revolutionary boyfriend, Odenigbo and Ugwu, the houseboy. The choice of narrators,especially of Richard and Ugwu is such a master touch as their views helps us understand the war much better. The books begins somewhere in the early 60's and Chimamanda chronicles the life of a bunch of middle class intellectuals very well. Ugwu's narration is so full of innocence and belligerence. Soon, something sinister happens that damages the fabric of trust in the household. We are however, not told what really happens ,before we get to read about the initial years of the war.Chimamanda,adroitly manages to make us wonder what really happened even while we are neck-deep into what happens during the war. Definitely, a masterful touch. The narrative switches back to early sixties again and she lets us in on the secret and expertly guides us back to the later part of the war. Stories about war always invoke sadness and this powerful novel by Chimamanda is not an exception. The story-telling is brilliant and what really takes the cake is the ease with which she has managed to blend everything(love, lust, loss, deception , patriotism, ) so seamlessly into a heady concoction.I loved the character of Kainene, Olanna's twin sister,who is so different from Olanna and is so irreverent that it makes her adorable . Oh,She also forms an important part of the story. One's heart will just go limp with disbelief at description of the living conditions that prevailed during the war and the atrocities that were imposed on civilians. Very true that in war,everybody is a loser. Chimamanda lost both her grandfathers in the war and the tales of people around her acted as fodder for the book. Overall, a poignant novel which is will come haunt you many hours after you have finished it. It will make you sigh of relief that you were lucky enough to have not gone through such inhuman conditions. This week I have 2 books to finish - The tent by Margaret Atwood and Bone in the throat by Antony Bourdain. The Atwood book is supposed to be a collection of "Fictional- essays".What does that mean ,anyway? :-) I am excited to start that book because I read Oryx and Crake ,loved Atwood's writing and have been wanting to read another book by her. Antony bourdain's book will probably be fun read for the week,as the blurb behind the cover made it sound like loads of fun..
"A superb tale of violence and backbiting set in the seething testosterone-heavy company of a crew of New york cooks." says a review. I am not even going to mention Murakami's Kafka on the shore as I somehow keep postponing reading the book because I own it. Someday,when i am not inundated with library books,I'll probably get to it :-). 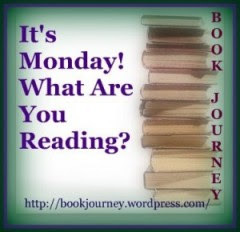 Have a super reading week.. What are you reading,btw? 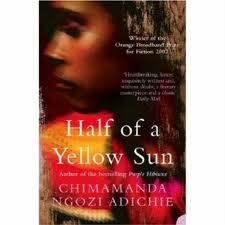 I've saw a number of good reviews for Half The Yellow Sun. It looks like the kind of book that appeals to me and so it is on my tr list. The Tent is also on that list. I love Atwood. She is one of my favourite authors. I enjoy Margaret Atwood's books, and haven't read The Tent. Going on my list! Karen.. I have only recently discovered Atwood and love her writing too..
Creations.. The tent is a lovely book..
Just hopping through, enjoy your week's reading. Half the Yellow Sun sounds very intense. I might have to add it to my to-read list. Half of a Yellow Sun sounds really good and Bourdain is really good, I listened to him on audio. Sheila.. Interesting!.I find him quirky and fun.. that would hopefully reflect in his writing..
Half of a Yellow Sun is indeed a very poignant read and one I was glad I read, it made me more aware of what went on in that part of the world. Last week in books and the seven classic plots..